Chada Beach Resort Koh Lanta is a luxury resort newly opened in 2005 on the phantastic beach of Khlong-Dao of Lanta Island. The hotel is styled in contemporary Thai design with all facilities, amenities and decorations at the highest standard which combined with a well-trained staff of utmost servicemindedness will make your beach holiday on Thailand's newest beach destination most pleasurable. The Chada Resort features a selection of tastefully decorated and homey suites and bungalows, most suites have private jacuzzis and all amenities you would expect from a luxury resort. The bungalows even have a private pool and could be called pool villas. All rooms have a private bath, hair dryer, phone, satellite television, water heater for making tea and coffee, minibar, refrigeratior, air conditioning and balcony or terrace. 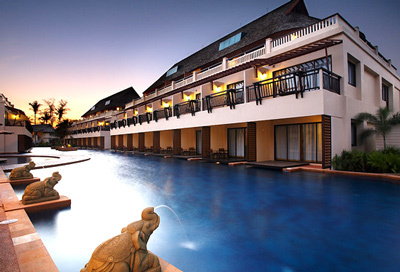 Serving international cuisine with a Thai flair, amidst a tranquil setting of fountains and waterfalls. Delicious Thai dishes plus a wide variety of snacks and sandwiches, serviced with a dramatic view of the Andaman Sea. Live music, cocktails, and delicious Thai food. Eat, drink and be merry! !